What file format should a picture have? JPEG and only these! 8 - 12 Mb size is fine. If bigger, a download becomes longer. Topixx is generating a preview of about 30Kb and a thumbnail of about 3 Kb. Topixx stamps a watermark into the preview. That should protect the preview against an uncontrolled utilization. Yes, in all information fields you may use umlauts. But it is suggested to write the same word also without umloud ex. "Schröder" and "Schroeder". Umlauts are always a problem since different browsers with different settings might display them wrong. Try to avoid! How should I caption a pictures? For captioning we suggest using Photoshop or the very good shareware program GraphicConverter. Most of other programs are not really Photoshop compatible. GraphicConverter is also a useful picture browser and you might use it for cropping and many other adjustments. Unfortunately it exist only for Mac 68K, PPC and OSX, but not for Windows. How should a file name looks like? How should I NOT name the files? No special characters, no space, no quoting like " or ' , no slashes like / or \. The server might recognize these as program code. Use underscore and hyphen to separate parts in the filename. What is the easiest way to bring pictures in the system? Enter your server name or the IP address, user name and password then click OK or connect. Drag your picture files onto the folder /photo. But transmit only the files not a folder! The rest will do topixx for you. Please notice that the transfer mode of the FTP program has to be Raw Data, do not transfer MacBinary or Text files. Read the admin manual ! Why keeps the picture file laying in the /photo folder and is not being imported? Something is wrong with that file. Could be no Photoshop Jpeg format, or file upload is not really completed. It makes sense to activate the 'upload continue' option of the FTP client program. You will find that in the preferences of most of the FTP clients. With this option enabled a broken upload will continue after reconnect. BTW. with a virtual server the peak hours, between 16:00 und 20:00 are never a good time for uploading. At this time period the Internet and the server is mostly strong busy. If those limitation starts to bother you, order a dedicated server! How can I search for pictures? By entering space separated search strings. The choice is to wide. How can I narrow the selection? By entering more space separated words ex. 'berlin politic schroeder' or using the extended search option. May I look for the date? Yes, but in a special format YYYYMMDD ex. 20010815 is the 15. August 2001. You might use parts of it and in combination with other words. Ex 'Schroeder 200109' shows all pictures of the German chancellor of September 2001. How can I control and manage the user list and what tasks are permitted? Searching, seeing thumbnails and previews is allowed to everyone. The preview is protected by a visible watermark from unauthorized web publishing. Printable files can be downloaded only by a registered user. Customer has to register with the server. He can choose his own username and password. Following the business rules of the owner, a registered user is permitted to download immediately after registration or after the owner set this user active. It depends on the default settings. The first has the advantage of getting access to the printable files without any delay. But it includes the danger of a fake registration. With the second option, the owner can control the customer and set him active later. This can be done by a mouse click in the user handling list. Of course users can be edited and deleted. How can I get any information about the server? Beside the normal statistic of the webserver. Topixx writes three log files, those keep you informed about every search request, every preview watch and every download. Further the server send you an e-mail in case someone has downloaded something. Also if a new user has registered, the server will send the admin an e-mail. The admin can send the log files to the own address and delete them once a month. How can I erase pictures? You have to be logged in as user admin. You might do this by entering the URL www.sitename.tld/sitename-cgi/.sec/topixx? you may also click on the link admin of the preview page. After entering username: "admin" and your password you are in the secure section. After a search you will notice a delete button under the thumbnails and previews. A click on it will delete the database record the picture file it self will remain on the server until you remove it with an FTP program. The transfer is very slow - what is the reason? In case of a virtual server that can depend on other power consuming tasks at the same machine. This will go away very fast. 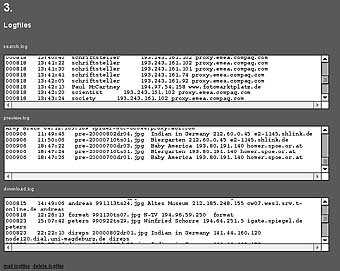 You can also check your connection and any bottle neck on the way to the server, by using a traceroute program. A program for Mac you might download from ftp://ftp.tomsand.com/pub/WhatRoute FAT.sit. A Windows user can use tracert which belongs to every Windows system. I've got my own webdesign and want to make request from there? If you call topixx simple with /yoursite-cgi/topixx? it'll open a frame set containing two frames. The upperframe for entering your search string, the lowerframe for displaying the results. But you or your webdesigner can also make request to topixx from external HTML documents. In that case the design must include FORM TAG´s in the HTML documents. op=thumbnails1 , with function barn; op=thumbnails2, without; op=thumbnails shows thumbnails as list. As target you might choose your own frame target= my_frame. Further you should adjust terms.html and help.html to your own needs. also topixx comes on a "as it is" base, please contact topixx for adjustments and help.